For a hand-built amp, the price is very reasonable indeed. 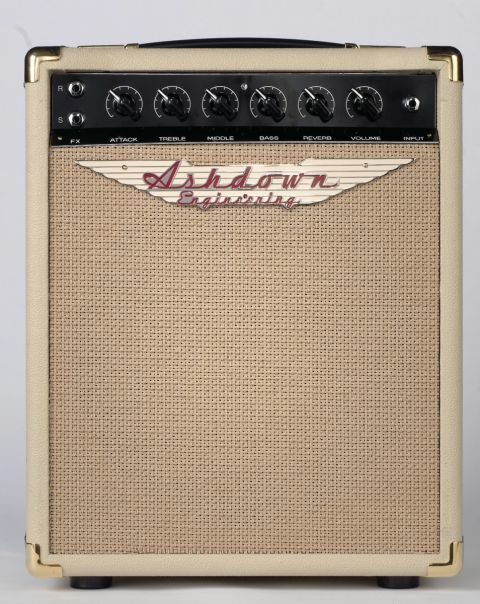 Capable of handling almost any musical style, this new Ashdown should find a lot of admirers. Wide tonal range. Cool looks. Ultra low noise. Price. The cabinet needs some more styling work to completely finish it. Overall, it's a high-quality, versatile combo. Some of the cabinet detailing on our review example could have been better. You can connect external speakers and utilise a DI recording output on the rear panel. The Ashdown's 'attack' control is a powerful feature. There are probably almost as many jokes about Essex blondes as there are guitar amps, so perhaps it was only a matter of time before someone linked the two together - and who better than Essex-based Ashdown Amplification to do it. The previous bass amp specialists have been steadily forging a reputation for guitar amps for a few years now, with some superb designs such as the Peacemaker heads and the high-powered Fallen Angel. These are big amps for big occasions, but there are many times when something smaller is called for - hence the Essex Blonde. It's a new addition to the hand-wired range and available with either a single-ended eight or dual 15-watt output stage. Ideal for practice, recording or small to medium club gigs, it features similar build quality to the hand-wired Peacemakers, but at a very good price. Ashdown's amps are always well-made and the Essex Blonde is generally no exception, with cream vinyl covering a small but perfectly formed cabinet which features MDF sides - with a ply baffle for the rear-mounted Celestion G12H-30 loudspeaker. The tough-looking chassis is non-magnetic stainless steel with welded corners and an integral rear grille that serves to protect and ventilate. The circuit is neatly laid out on three hybrid PCB/turret boards, with chassis-mounted controls and valve bases. The component quality is exceptional for an amp of this price and the electrical build standard is first class, although some detailing on the cabinet isn't as good as it could be. On the rear you'll find a small notch in the baffle for the loudspeaker lead which looks slightly shoddy - there's a small shelf in the Essex's stainless-steel rear baffle wide enough for a slot to take a speaker cable, and we think it would have looked better done that way. The Essex Blonde is fairly easy to get to grips with: a three-band EQ is complemented by volume and reverb controls, while a knob called 'attack' varies the amp's overall tone and dynamic response. There's a pair of send and return sockets on the front panel for the Essex's effects loop, and on the rear panel you'll find a pair of speaker outlets and a useful direct injection recording output that disconnects the amp's internal driver. Reverb is handled by a small Belton tank that sits in the bottom of the cabinet, underneath the loudspeaker. Despite the relatively modest 8-watt output from its single 6V6 output valve, this is a surprisingly loud amp with a lot of clean headroom. There's plenty of range on the tone controls to accommodate any guitar - Strats and Teles sound bright and spanky, while a humbucker-powered guitar (our benchmark PRS McCarty) sounded sweet and warm without too much mid-range to spoil things. At fairly polite volume levels, you can lower the amp's treble, and maybe take a little off the guitar too, for an excellent jazz sound with a rich woody bark that just starts to growl with the volume knob at the halfway setting. The reverb is very flattering to this style of playing, as it's not overly bright and has a smooth medium- length decay. Turn the volume knob up higher and the EB's alter ego of hot vintage blues starts to show through. It's here that the attack control comes into its own, enabling you to either smooth the amp's response for a slightly compressed feel that records exceptionally well or, conversely, exaggerate the amp's dynamics for intense, stinging guitar solos. There's an incredible range on this control - it takes you from a smooth vintage tweed Champ-style of distortion to a gnarlier and more aggressive effect - similar to the kind of crunch an AC15 with old valves makes when it's hammered. Talking of old valves, NOS nerds will be pleased to hear that the Essex Blonde can use any commonly available octal (eight-pin) power valve without re-biasing, which adds even more sonic flexibility. With no master volume control, all the distortion effects happen at impressive levels, so for overdrive sounds at lower levels some kind of stompbox will come in handy. We used a Klon Centaur and were well impressed with this combination, although any decent Tube Screamer-type of overdrive should provide a similar result. The DI socket on the rear panel makes recording or hooking up to a larger power amp easy, which considerably increases this little amp's flexibility. The unbalanced direct output is exceptionally clear of noise but we'd still encourage home recordists to use a microphone because the loudspeaker is superb. We rate Celestion's G12H-30 very highly indeed for authentically capturing that 1970s classic rock tone, offering an understated yet detailed mid-range with a sweeter treble than its more often-encountered big brother, the Vintage 30. The G12H's only drawback is a lower power handling capability of around 30 watts (the Vintage 30 is confusingly rated at twice this figure), so it's not suitable for the average 1 x 12 50-watt combo, but used in pairs or alone in smaller amps like this one, it's one of the sweetest guitar speakers you'll hear. So, here is an amp that packs a lot of tonal and dynamic range into a small and easily carried cabinet; it's perfect for recording, practice or small club gigs and can easily be mic'd up or slaved for bigger stages. And the attack control is what takes the Essex Blonde into 'boutique' territory This single control makes it possible to dial in anything from polite jazz to sweet country, to vicious blues rock or new-wave pop. It's deceptively powerful and takes a while to learn, but is worth it for the rewards of flexibility.